Building on Infiniti's legendary sports sedan design, performance and technology leadership, the all-new 2014 Infiniti Q50 is designed to create a new, distinct level of customer engagement when it launches in the North American market in summer 2013. The Q50 rollout will be followed by other Infiniti global markets later in the year. 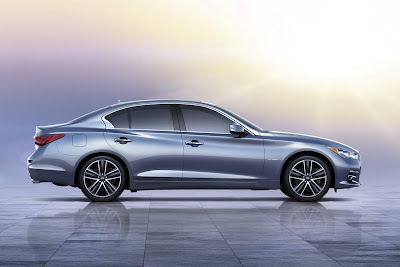 Said Infiniti President Johan de Nysschen: "This exciting new Infiniti Q50 stretches the boundaries of what a sports sedan can be, propelling Infiniti in a bold new direction." While Infiniti sports sedans have always been noted for their outstanding proportions and presence, the new Infiniti Q50 adds a new dimension of premium style. Its strong first impression is anchored by the smooth yet dynamic character line arising from its "double arch" grille. It energetically flows through the bodyside like a wave and merges with the rear end, creating a highly fluid and intriguing profile and fully illustrating the Infiniti Q50's dynamic and athletic stance. "The Infiniti Q50 reflects the direct influence of the Infiniti concepts known as the ‘Infiniti Trilogy', particularly Essence, while honoring the iconic design dynamics of earlier Infiniti sports sedans. The new Q50's athletic and tightened appearance blends its lower and wider proportions with enhanced interior roominess to stunning effect inside and out," said Shiro Nakamura, senior vice president and chief creative officer. Signature Infiniti exterior design features include the "double arch" grille, dynamic arch roofline and Crescent-cut C-pillar. The front end is decidedly aggressive, with a sport front fascia offered on the Q50 sport models. The new grille's three-dimensional, textural quality is provided by elaborate detailing of the waved mesh pattern surface and chrome surround, while the distinctive LED headlights and marker lights' sharp lines suggest an almost human look. The lean, robust body sides are designed to anchor the performance stance with a strong, solid "bone" and arched roofline that flows to the Crescent C-pillars that are similar to those that originally appeared on the Essence Concept. In the rear, the side character lines smoothly merge with the shape of the rear LED combination lights. The familiar rear double-arch trunk line completes the strong, unforgettable view from behind. Heated outside mirrors with integrated LED turn signals are standard, while a power sliding and tilting glass sunroof is optionally available. Other exterior refinements include new door architecture with narrower, roll-formed A- and B-pillar sashes that provide improved ingress and egress, as well as a more open cabin environment. A new color palette has been specially selected to accent the Q50 contours and sculpted surfaces and includes a range of eight premium colors. The new body design also offers enhanced airflow over both the upper and lower body portions, resulting in a coefficient of drag of just 0.26. The Q50 also features zero front and rear lift. "Moving forward, we want all Infiniti vehicles to reflect an energetic force rooted in nature, such as the shape of a dynamic wave," said Nakamura. "The Q50's enhanced sense of three-dimensionality gives it a look of strength and agility – a look that is highly personal, seductive and slightly mysterious." Throughout the Infiniti Q50's development, compromise was never an option. No compromise on innovation, design or performance targets, allowing the development teams to stretch the boundaries of what a sports sedan can be. 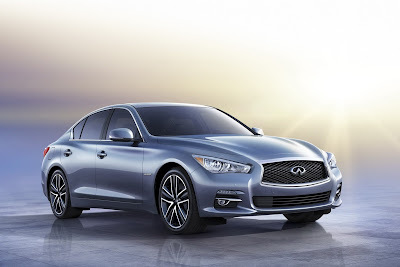 "The new Q50 amplifies every driver's performance preference and enjoyment behind the wheel. We have one of the fastest accelerating hybrid engines, which also happens to be projected as one of the most fuel-efficient. We have advanced performance and safety technologies that can see and react before the driver can. And, we have the world's first quick and precise Direct Adaptive Steering technology," said de Nysschen. At launch in North America, two advanced powertrains will be available, followed by additional engine options in other global markets later in the year. The Q50's refined 3.7-liter aluminum-alloy DOHC 24-valve V6 is rated at 328 horsepower (est.) and 269 lb-ft of torque (est.) and features Continuously Variable Valve Timing Control System (CVTCS) and Variable Valve Event & Lift (VVEL®). The available hybrid powertrain features the Infiniti Direct Response Hybrid™ system with Intelligent Dual Clutch Control. It combines a 3.5-liter 24-valve DOHC aluminum-alloy V6 and compact laminated lithium-ion battery design with an innovative one-motor/two-clutch motor control. The system's V6 is rated at 296 horsepower (est.) and 255 lb-ft of torque (est. ), while the advanced 50 kW electric motor is rated at 67 horsepower (est.) and 199 lb-ft of torque (est.). The hybrid system net power is 354 horsepower (est. ), providing strong acceleration and lean fuel economy. "True to the Infiniti DNA, our hybrid powertrains put performance first, without compromising fuel efficiency. It takes full advantage of the electric motor's instant torque for exceptional acceleration and, in combination with the 3.5-liter V6, provides a sporty driving feel under all driving conditions. We have targeted the best balance of performance and fuel economy and hit it dead center," said de Nysschen. Both Q50 powertrains are matched with an advanced 7-speed electronically controlled automatic transmission with manual shift mode and available steering column-mounted magnesium paddle shifters. The Q50 is available in rear-wheel drive and Intelligent All-Wheel Drive with both powertrains. Precise handling is provided by the 4-wheel independent multi-link suspension. The front is a single pivot double-wishbone design, while the revised rear design utilizes a multi-link design with coil springs and Dual Flow Path® shock absorbers, with increased camber stiffness and improved ride comfort. The suspension features extensive use of lightweight aluminum components, along with front and rear stabilizer bars. A sport-tuned suspension is available with Sport models. Also supporting the enhanced handling is an improvement in front body stiffness (versus the previous generation). The Q50 rides on 17-inch aluminum-alloy wheels with machine-finished surface with 225/55R17 all-season run-flat tires. Also available are 19-inch aluminum-alloy sport wheels with 245/40R19 run-flat all-season or summer tires. Confident braking is provided by 4-wheel power-assisted vented disc brakes with 4-wheel Anti-lock Braking System (ABS), Electronic Brake force Distribution and Brake Assist. Also available are sport brakes with upgraded rotors, 4-piston front calipers and 2-piston rear. Steering is provided by a power-assisted vehicle-speed-sensitive rack-and-pinion system. The new Q50 also features available Infiniti Direct Adaptive Steering™ technology, a world's first production vehicle design. The system allows independent control of the Q50's tire angle and steering inputs, transmitting the driver's intentions to the wheels faster than a mechanical system. This increases the direct driving performance feel by quickly and intelligently communicating road surface feedback to the driver. Four different steering settings are offered, allowing customization by driver preference or road conditions. This world's first technology provides the flexibility for the driver to change both steering effort and the steering gear ratio. A backup mechanical steering system is provided with models utilizing the new Direct Adaptive Steering technology. Also offered is another world's first, Active Lane Control™, which uses a camera-based straight-line stability system to further enhance on-center driving capability and improve vehicle stability. The system is included as part of the Lane Departure Prevention system, not only adjusting for unintended lane drift, but also making finer adjustments for minor road surface changes or crosswinds (as detected by the camera-based, lane marker detection system). The system goes beyond the traditional Lane Departure Prevention system, taking it a step further by not only reading the road ahead (the camera is located above the rearview mirror) for unintended lane drift but also by making small steering input angle adjustments if the Q50 undergoes minor direction changes due to road surface changes or crosswinds (as detected by the lane marker detection system). By reducing the need for steering input for the driver, the driver's effort may be reduced. "The beauty of these advanced systems is to allow a more personal driving experience, with more input when desired and less intrusion of road imperfections in the steering wheel," said de Nysschen. "These are just the start of a range of future technologies that are becoming a point of differentiation for our Infiniti customers." In fine-tuning the Infiniti Q50's exceptional performance standards, Infiniti's partnership with Red Bull Racing enabled three-time Formula One World Driver's Champion Sebastian Vettel and the team's Test & Reserve driver Sebastien Buemi to provide an extra dimension to its development. With the goal of making the new model the most dynamic and exciting sports sedan on the market, Vettel provided input on the Q50's performance and handling at Infiniti's Tochigi facility in Japan. Buemi tested at Nurburgring – one of the toughest proving grounds in the world – pushing prototypes to the limits to help produce a chassis with outstanding handling characteristics. Infiniti recently announced that from 2013 it will be Title Partner and Technical Partner to ‘Infiniti Red Bull Racing.' This deep collaboration will lead to joint technical projects for mutual benefits on the track and the road. "Having the opportunity to receive feedback on chassis development from two world class drivers is priceless," said de Nysschen. "Our partnership as ‘Infiniti Red Bull Racing' is an extensive one. We are working together to identify a number of areas for technical collaboration and to apply the benefits of partnering with the Formula One World Champions to our own people, processes and technology." Another way that the new Infiniti Q50 raises the performance standards in class is the high degree of available personalization, which is made possible with the new fully customizable digital environment. The system works with the vehicle's advanced i-Keys to recognize the vehicle settings for up to four different drivers. Offering a sense of "my car knows me," the i-Key can recognize each driver and automatically engage pre-set preferences for driving position, heating and cooling, audio, navigation and telematics. For example, up to 96 optional settings in are offered in the custom mode alone. Easy setting or changing of settings is accessed through the innovative dual touch-screen displays. In addition, by using the drive mode selector located on the center console, engine, transmission, handling and steering adjustments can be instantly tuned, for example, for sport or touring settings. Matching the inspired Infiniti Q50 design and performance is an interior created to the same extraordinary standards. The interior environment offers a powerful blend of three-dimensional textures, highest craftsmanship and premium quality, combining modern luxury and user-focused advanced technology. "An interior is a confluence of thousands of parts and many materials, including leathers, fabrics, metals and glass. The harmony with each element is an important part of the Q50's warmth and high quality feel," Nakamura explained. "Our designers approached the integration of every element in the interior in terms of not just function but also of stimulation of the senses – color, touch, texture, finish and beauty – creating an environment that is both intuitive and indulgent." The Q50 interior is also designed as an invitation to drive – to celebrate the elation of driving that is often lost in the modern world. As such, special attention was paid to the driver position, offering a generous range of customizable adjustments within a cosseting yet comfortable cockpit. The Q50's instrument panel honors Infiniti's "double wave" design tradition, while updated with a new asymmetrical flow from the top of the center cluster to the wide center console. Access to all key operations and controls is designed so that the driver does not need to change driving posture, including use of hard switches, touch panels and drive mode selector controller. The front and rear seats are a new ergonomic design, developed to help distribute body pressure across a wider range of the upper seating surface. When sitting, the pressure load on the backbone is about 1.4 times greater than while standing. The bending moments that become a factor of load are reduced by the new seat design, with the additional support for the pelvis and the self-weight of the chest. Finishing off the elegant interior is a combination of "Kacchu" aluminum inspired by traditional Samurai armaments and genuine maple wood trim, which is representative of the 16th century Urushi painting technique. 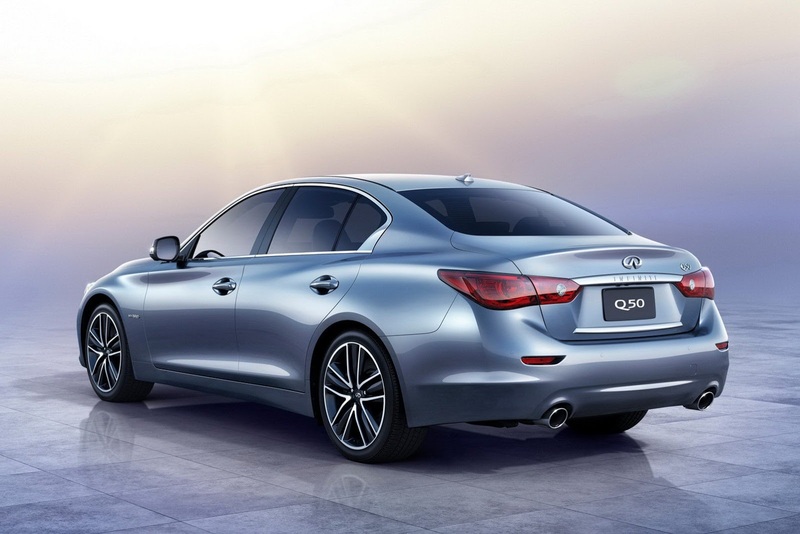 "Quality is another Infiniti Q50 strong point," added Nakamura. "Our designer's passion, obsession with detail and devotion to craftsmanship and continuous improvements ensure we are producing a truly premium product of the best quality." The Q50's quiet cabin is augmented by standard Active Noise Control, with cancelling of intrusive low frequency noise from four door-mounted speakers, allowing easy conversation with passengers. Premium audio systems include an available next-generation Studio on Wheels by Bose® audio system with a new instrument panel 3-speaker array (14 speakers total throughout the cabin) and Advanced Staging Technology®. SiriusXM Satellite Radio (SiriusXM subscription required, sold separately) and High Definition (HD) radio are standard. Other features include Dual-Zone Automatic Temperature Control, Bluetooth® Hands-free Phone System, RearView Monitor and available Advanced Climate Control System (ACCS) with Plasmacluster® air purifier and Around View® Monitor with Moving Object Detection. Building on Infiniti's unique approach to making owners' lives easier, which includes the Infiniti Personal Assistant program with 24-hour access to a live team of professional assistants, the new Infiniti InTouch™ telematics system brings the future of in-car connectivity to the Q50 interior today. Unlike conventional interfaces, the Q50 has not one but two touch capacitive screens with intuitive hand gesture screen operation to easily connect drivers to their lives outside the car. "We have new technologies that embrace the way people live today – seamless connectivity and personalization everywhere they go, including while in their cars, with an optimized human-machine interface for ease of use," said de Nysschen. Along with the large dual screens, the Infiniti InTouch™ system is designed to effortlessly synchronize car and driver. Content and functions directed to the upper screen includes the most frequently used applications, such as navigation maps. Other content is directed to the lower display screen. The two screens work together so that, for example, the navigation map can be viewed on the top screen while setting destinations or finding points-of-interest can be done on the lower screen. A limited number of critical functions, such as heating and cooling, are operated by hard switches. Content can be customized using easy-to-understand menus. A selection of vehicle-centric apps will be pre-loaded into the system. Owners will also be able to download, update and synch personal apps through their smartphones and USB drives. Additional details on the system's operation will be available at a later date. The final area of segment leadership for the new Infiniti Q50 is its advanced safety systems. Building on the long list of safety and security technologies already found in other Infiniti models, the Infiniti Q50 offers available Intelligent Cruise Control with Full Speed Range, predictive Forward Collision Warning (world's first technology), Forward Emergency Braking, Distance Control Assist, Blind Spot Intervention, Back-up Collision Intervention®, Lane Departure Prevention and Active Lane Control™. The all-new 2014 Infiniti Q50 will be initially offered in the United States and Canada beginning in summer 2013. At launch, two powertrains – the 3.7-liter V6 and 3.5-liter Hybrid – will be available, each in a choice of rear-wheel drive or Intelligent All-Wheel Drive and in a selection of trim levels, including Sport models. The Q50 will roll out in other global Infiniti markets beginning in summer 2013 and will include additional powertrain offerings adapted to respective market needs. "The new Infiniti Q50 is a true game changer in the sports sedan segment," said de Nysschen. "With its cutting-edge performance, design and technology, it breaks away from ordinary – just like the Infiniti brand."